AFA09 Day 2, Dinner with Zemotion! Our day pretty much started with a lunch date with Kaname! "Sorry to take up so much of your time. For the full version, you may want check it out on my previous journal entry, somewhere on the the 2nd half of it. And a video, for the ladies (and maybe, guys?) who want to hear his dreamy voice! The perfect bishie voice! Hahaha! 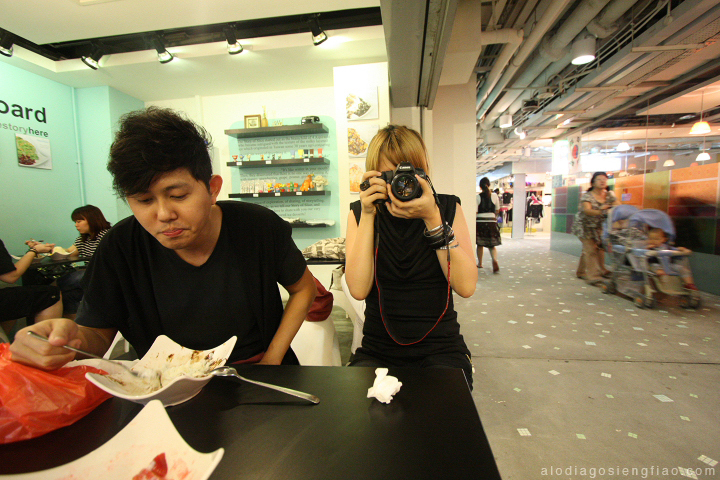 I was actually having lunch and filming the video at the same time. I had Fish and Chips while Ashley orangeish had a shrimpy dish. If you think I ate a lot, think again, Ashley orangeish The Bully, ate half of what I ordered...PLUS another dish just for her! HAHAHA! No worries! 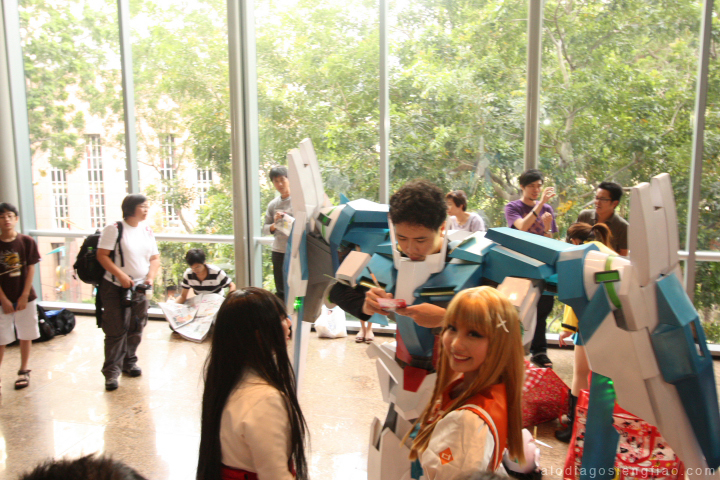 Cosplay Winners: Team Singapore Gundam 00: Clive and Caroline! Unfortunately, wasn't able to take pics of Team Thailand and the other Singapore Team because they were seated in another table. Seated near Kaname!! Sob!! Though Ash orangeish and I wanted to hang out longer, we had to cut it short. 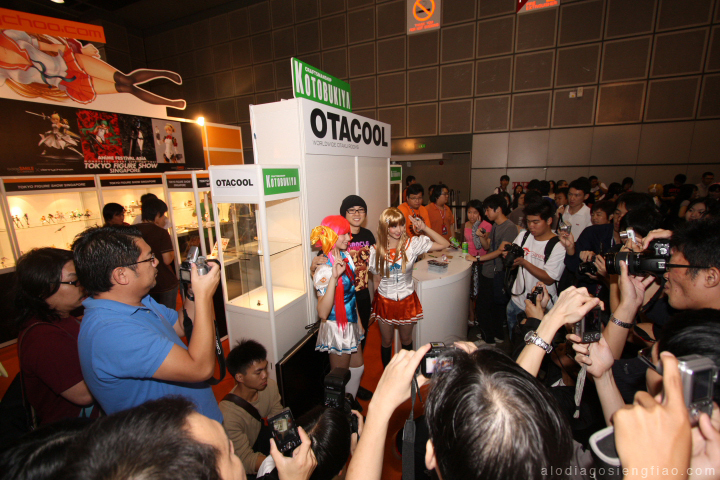 *sad* I had to be back at the convention at around 3pm for the OTACOOL book launch</u> at Kotobukiya's booth with Danny! Luckily, we got there in time. 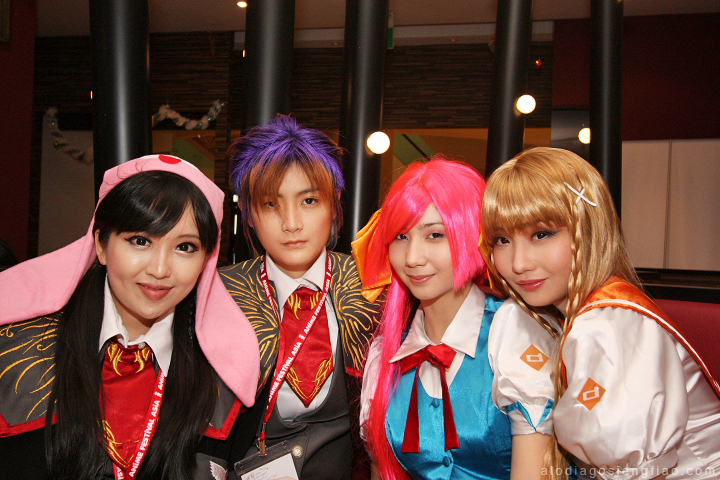 Had a few pics with fellow cosplayers in front of the booth before the Signing began. The book sold out on the first day so the team there prepared little cards for those who weren't able to get a copy. Gosh! GOSH! I forgot! Why didn't I get a little card for myself! *hits head* I think I was too awestruck with Danny's presence and the awesome people who came. Hahaha! 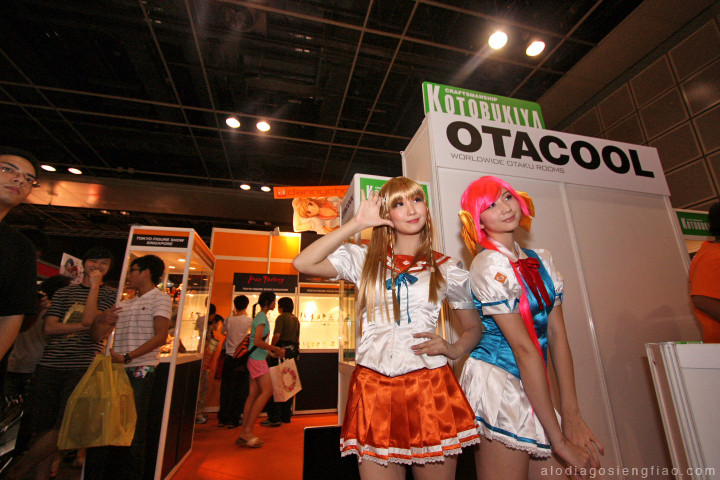 Oh yeah, lil sis Ashley orangeish and I cosplayed as the Suenaga sisters, Haruka and Mirai respectively. They are Danny's site mascots. We found the characters pretty interesting because we share a few similar facts. 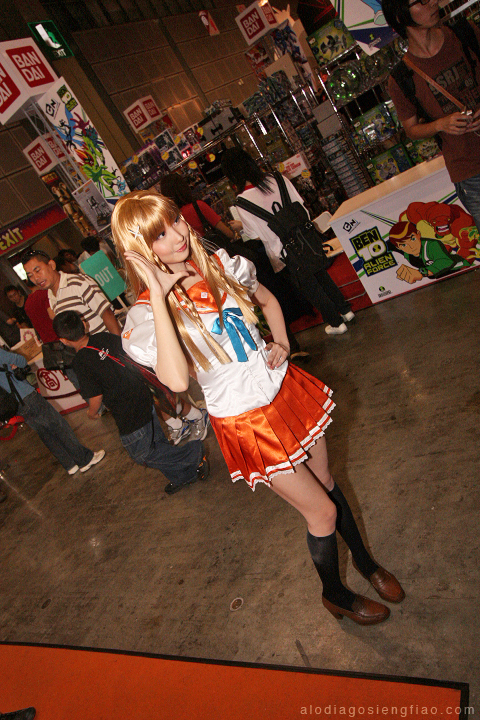 Mirai (the one I cosplayed) is the older sister and is a bit bustier than Haruka (the one cosplayed by my lil sis). Hahaha! *le gasp* How true!! The end! Just kidding! 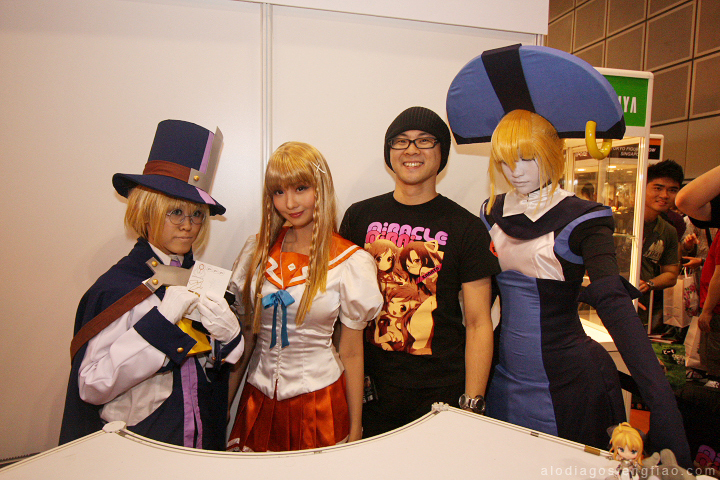 Me and a Mirai shirt! 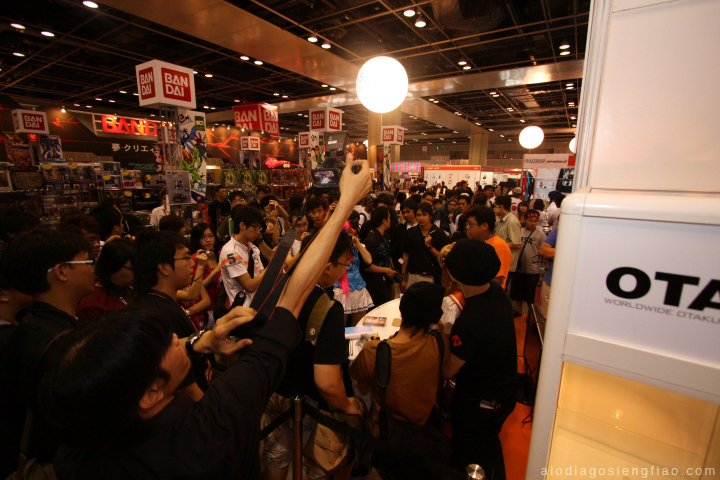 The signing went on pretty well and was orderly. 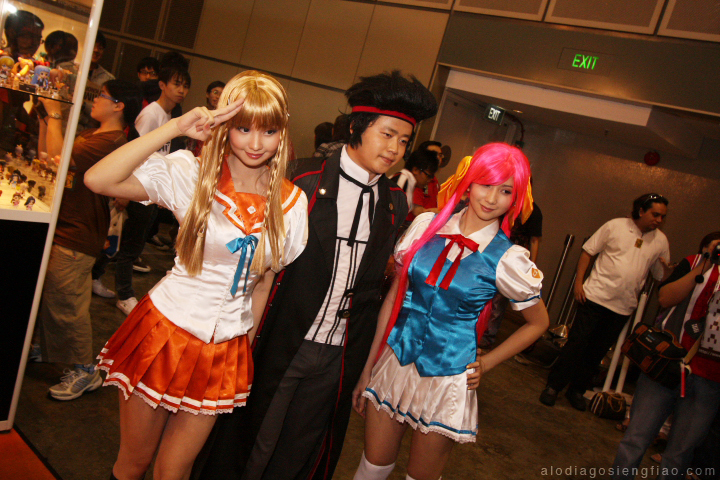 I met a lot of new people in the community, anime fanatics, bloggers and cool cosplayers. Jacqueline Kawaii-sekisetsu and ?. 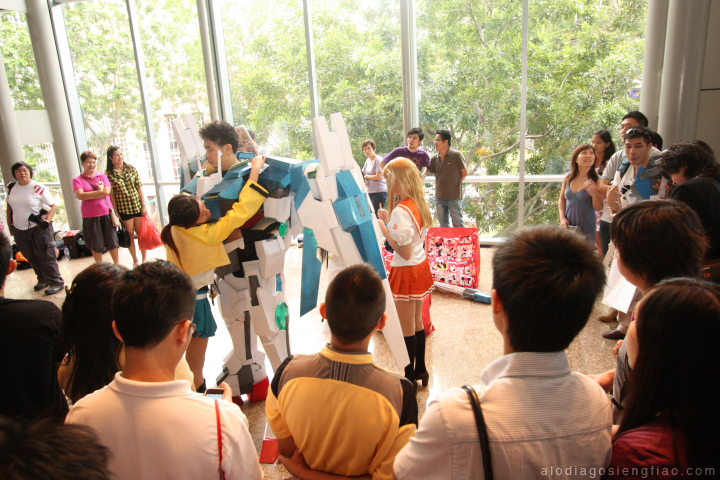 This cosplay pair was really awesome! The signing went on for a couple of minutes or hours? I'm not too sure how long it lasted because I didn't keep track of time. Forgot her name but this little girl belongs to Danny. He brings her everywhere! 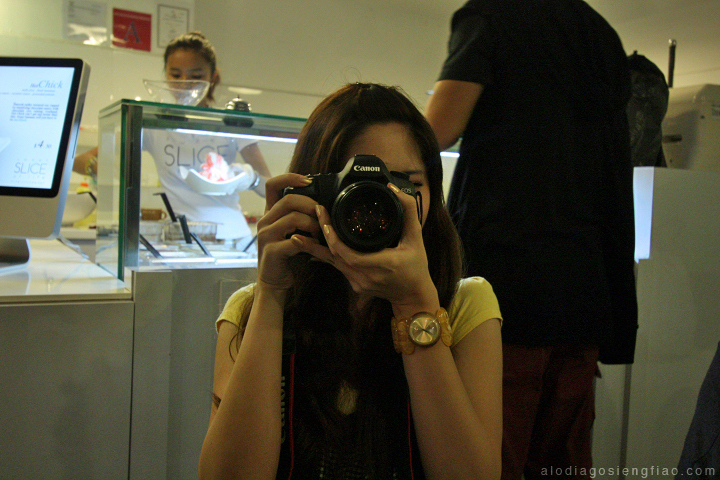 Ren of Maxicollector with Danny's camera! 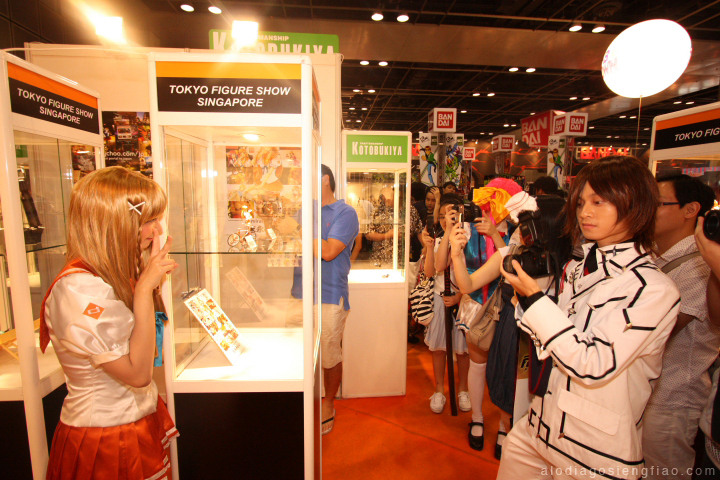 A Photo with Mirai figure! We were on our way out to do an interview for the show "Why You Do What You Do" but got stuck for a bit near the entrance. I'm still shocked that this guy wanted me to sign on his shirt with permanent ink. D: But hey, this guy was awesome! I'm glad that he knows and likes our cosplay works! Thanks, dude! UPDATE: Got a message from this guy in FB! 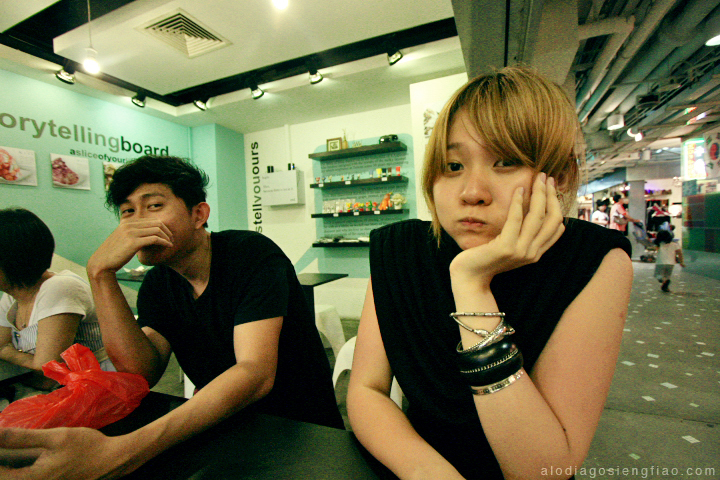 His name is Will Wee from Malaysia!! Me and Ming!! He's single and available! JK! 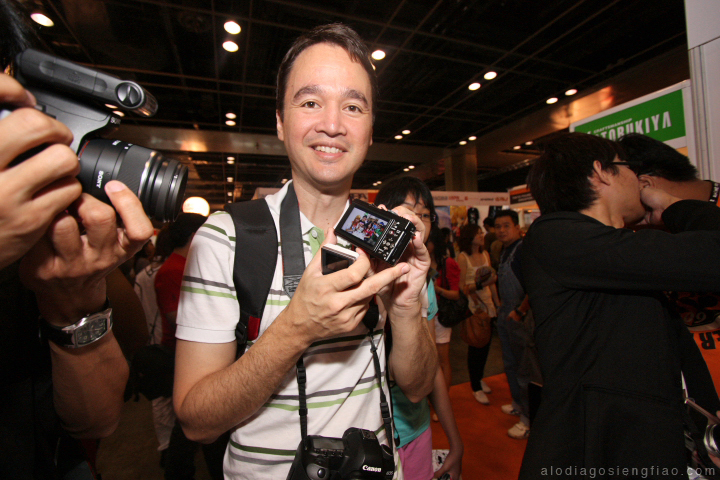 Met this cool guy the first time we went to Singapore a month ago, Nuffnang Blog Awards. 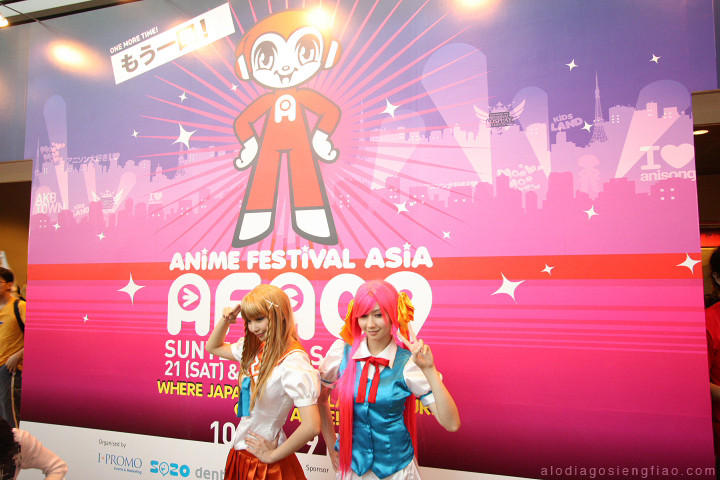 You can check out his entries about AFA here: Day1 and Day2! Finally, we got out and proceeded on with the short interview with "Why You Do What You Do". 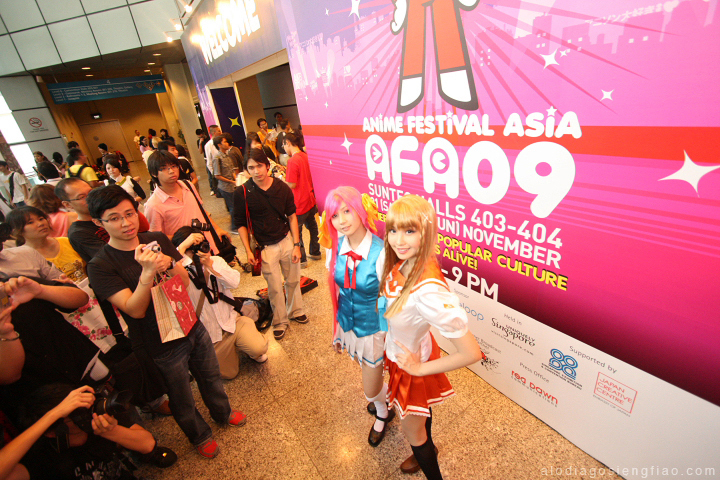 Basically, its about cosplay, the internet and AFA. The video isn't out yet but we'll be posting it up once it has been released! After a while, we decided to go to a much safer and quieter place..like Starbucks because we were getting tired. Haha! It has been a tradition for us to hang out in a coffee shop, preferably Starbucks, after a convention/event. I ordered a White Mocha Frap. But before getting my drink, I remembered that that was our last day in Singapore before flying back to the Philippines. So I excused myself for a bit and ran back to the convention to look for fellow cosplay participants. Really hunted for them because I had to bid them farewell and give my parting gifts. Someone said that they should be somewhere at the backstage but we found them at the other dressing room. I was so glad to see them there. 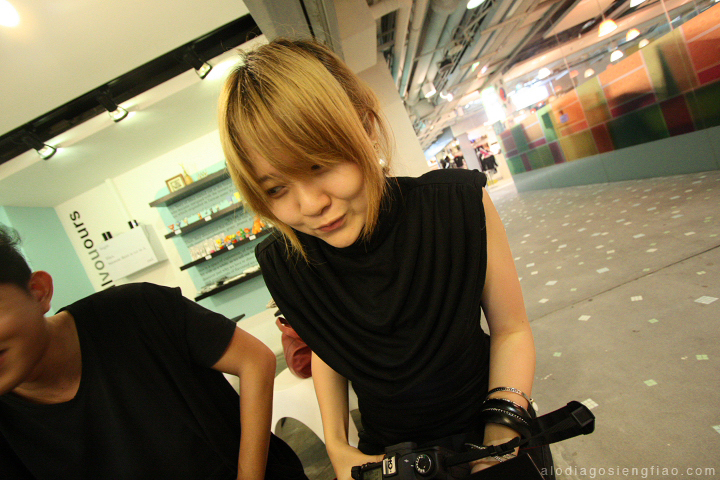 ...Jingna zemotion invited us to have dinner with her at this Japanese restaurant in Orchard Road, Nanbantte. The food there was really great! It was my first time to taste such kinds of food and I am definitely looking forward to going back there with my friends and family! She said, though, that it was pretty hard to get a seat there because it was always full. We pretty much hung out and just caught up with each other. 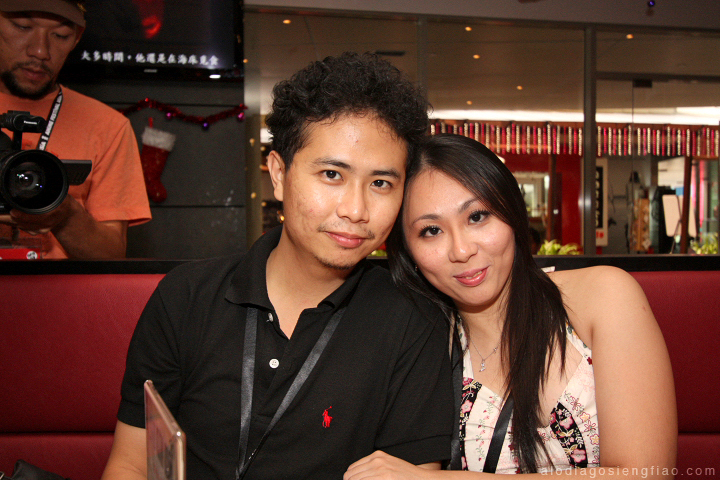 Zeng joined us for dinner because his girlfriend, Arissa, was sick. 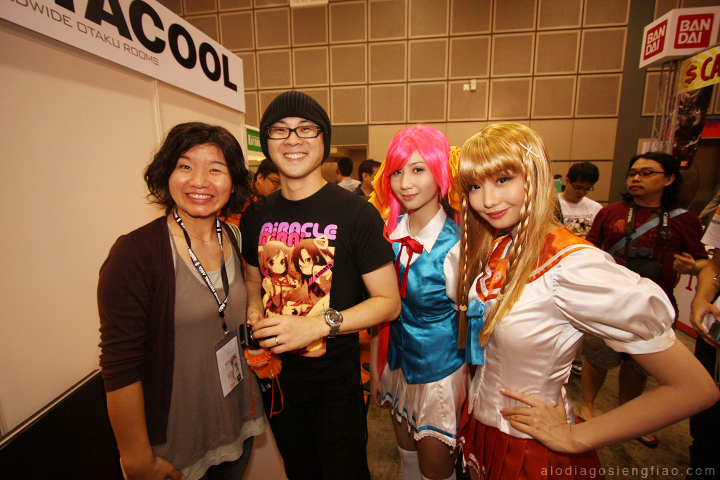 :c Anyway, that guy is pretty cool, he works at Lucasfilm Animation Singapore as an animator! Gosh! I hope I'd get to tour around that studio one day! It was fun hanging out with these guys because we had the same interests, art and games!! And bishie-guys (?) LOL! After dinner we had dessert in this shaved-ice place. I forgot the name. But it was also super good! I'm just glad that the competition was already over when we went out. So was not on diet then! Nomnomnom! hohoho! Jingna zemotion couldn't wait for her dessert! Ashley!! hurry up and edit the photos!! 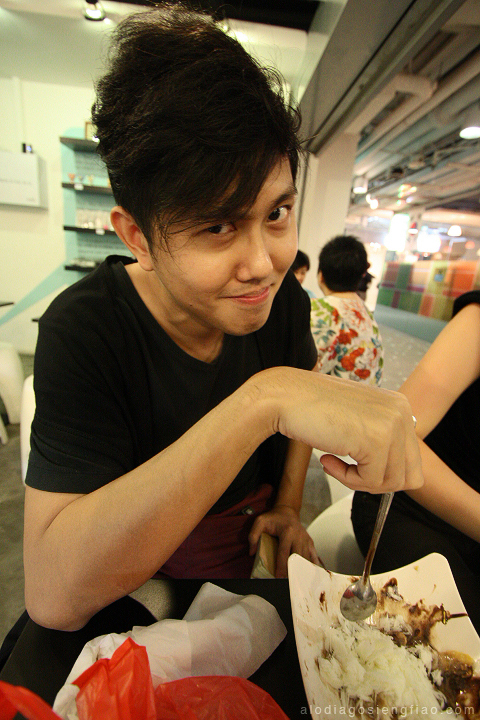 Zeng and his plate! hahahaha! Jingna zemotion also invited us over to her house to play Bayonetta (rawr! I hate you for having this game already, haha!) but we couldn't join her because we had to pack our things, costumes and props for our flight the next day. Well, that's all for now because this entry is getting long and I gotta burn files soon! Another convention is coming up this weekend and my computer won't be able to handle new files if it stays as it is. Special thanks to Ren of Maxicollector, and Joe for helping my dad fix the boxes and props for cosplay. Dad is the one in black. Photo from Danny. Thank you to Pef Decena for recording our segment/interview on Jam 88.3's "Fratpack" with Lambert, Mike and Tracy! Oh, my...i'd never imagine that you know each other (you and zemotion). you're so lucky! hehe. Looks like great fun! XD I feel lucky that a friend (Kodomut) kindly helped me get a card with you and Danny's autograph XD I enjoyed you and Ashley's cosplays Keep up the good work! 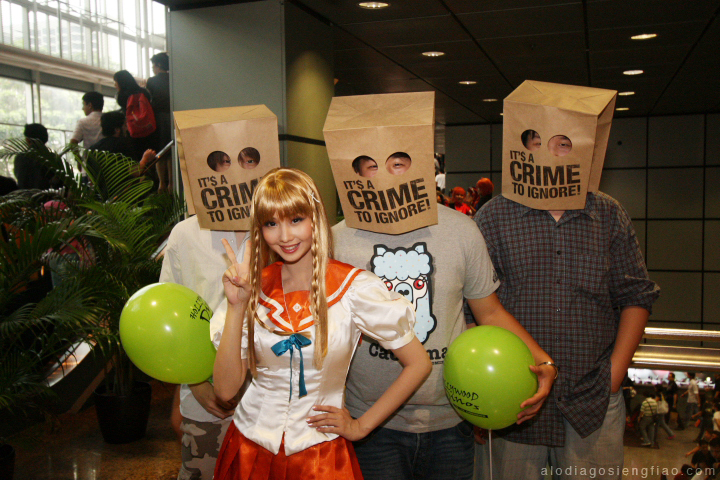 haha, parang hindi nah ako sanay sa simple cosplay niyo. masyado nah yatang natatak sakin ang bonggayshus themes niyo madalas pewo syempre, bagay pah rin sa inyo... haha! astig! I'm sorry to hear about your father. I hope all goes well for him. My grandmother actually passed away this morning... and I hope you won't experience the same gloomy atmosphere for the time being. 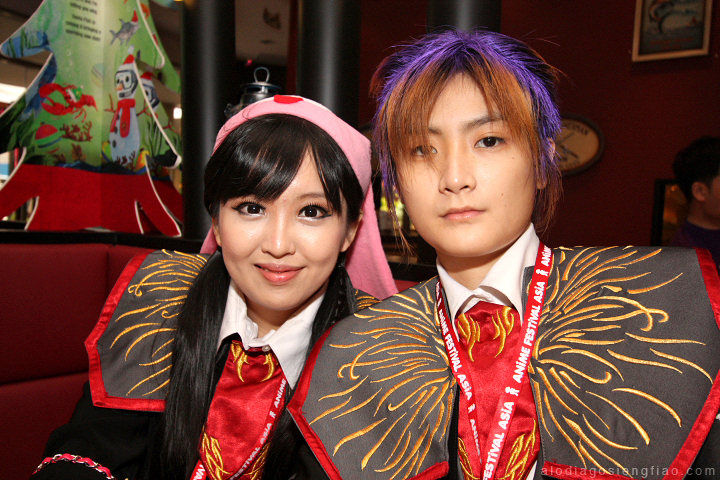 Alodia and Zhang Jinga on a dinner. I never thought I'd hear of my two favourite Deviantartist ever to even know eachother...! oooooo, so many pictures! thank you, i feel like i was there too! Cool! Thank you for doing the interview with Gino and Ayo! 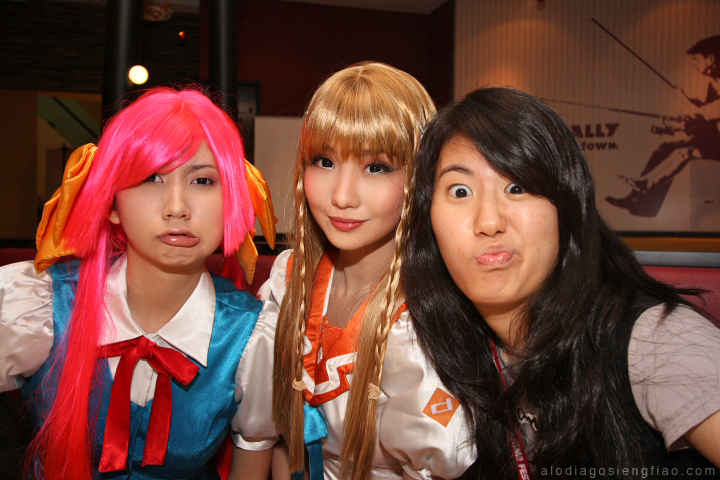 But that's not their blog daw Here's the link to WYD [link] They said thank you so much and that you were awesome in the Regional Cosplay Competition. To have the energy to do what you do is almost a miracle in itself, please impart some of that energy to us Edj (or at least make it more infectious - idamay mo kami haha), thumbs up to your dad for his awesome support! Love them all! seems to be so much fun! Awesome coolness! Looked like a lot of fun! Nanbantte T-T... I craves for teh japanese curry rice. 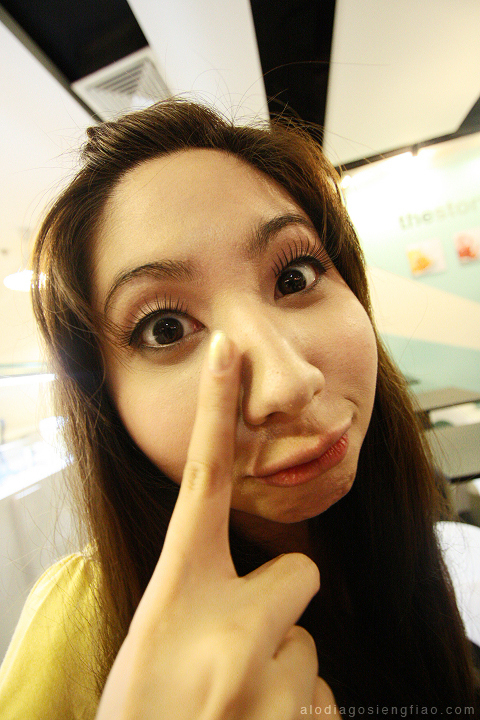 And those UWA close up shots... WIN! 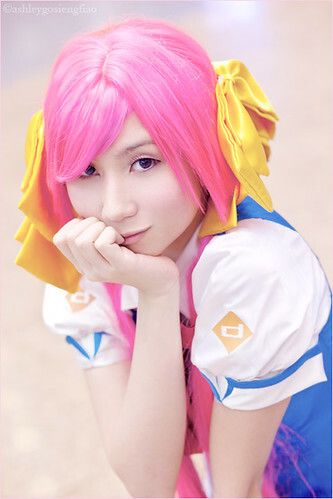 All the more reason I should go and save up for an UWA lens rather than a Macro..
*Er, Kagami Hiiragi. Gawd, I was confused with the Hiiragi twins. 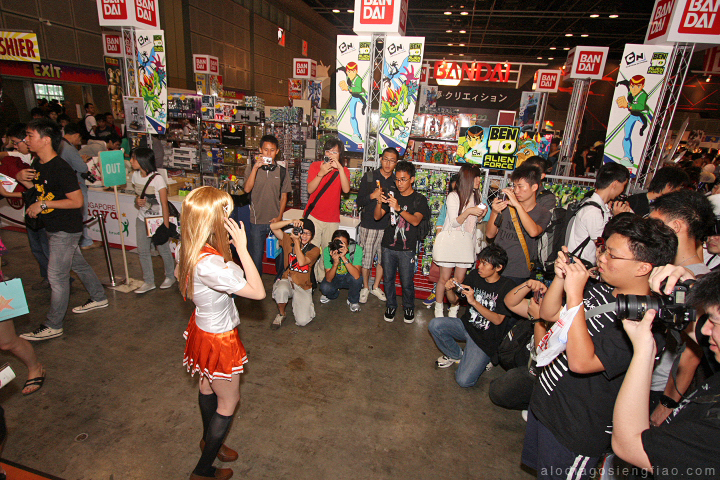 Alodia, the figure a.k.a Danny's little girl that you're holding is Tsukasa Hiiragi from Lucky Star. Orochi's kinda funny, he always has that poker face. Hahaha! Orochi's poker face is cute~ But s/he looks cuter when s/he giggles~ We always tease him/her to Kaname! Hahaha! wooooow me envY having dinner with zemotion ) that's so cool! 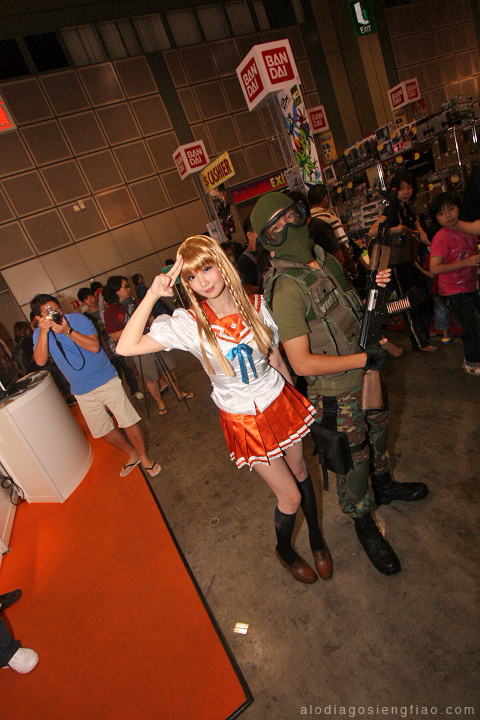 AFA seems to be really so much fun.